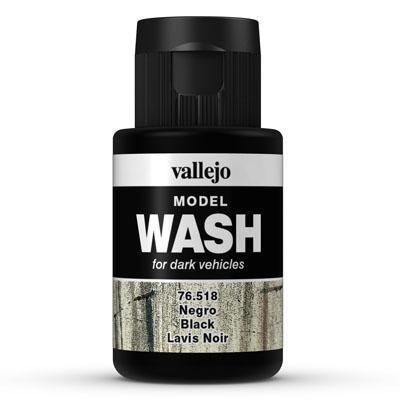 Model Wash is a range of washes created with a unique waterbased formula. The product provides the model painter with new techniques for rendering the processes of ageing and exposure to the elements. Colors with a matt finish and of high capillarity, formulated to bring forth the minute details of the panels of the model and the contrasts produced by the wear and accumulated grime caused by operative and weather exposure. The versatility of Model Wash makes the product equally useful for a quick shading as for the creation of caked dust and dirt around the details of the model, such as rivets and panel lines. The washes are also used as a filter, applied in a uniform manner on the model to modify the base color. Model Wash can be applied by brush and airbrush and dries very quickly so that after some 20 minutes the painting or weathering process can be continued. Painting tools are cleaned with water. Model Wash is not flammable, and does not contain solvents. Tip: Model Wash diluted with water or Airbrush Thinner are frequently used as filters.